I read the publication put out by this Minyan because I’m halachically curious by nature and Rabbi Donnenbaum puts in a good effort. One can have the odd quibble, and some are worth mentioning and others are probably not. For example, he mentions the custom to have a special reading of Parshas Zachor for women (even though they don’t need to hear it according to many opinions). There is a comment in bold that it is preferable that 10 men “be present” during the reading. The source is in Halichos Bas Yisroel which I have and just looked at. (I don’t own a Shevet Halevi so I didn’t check). Indeed, the author of Halichos Bas Yisroel notes that Rav Elyashiv z’l (among others) said to have ten men present. I had remembered, however, that Rav Gavriel Tzinner in Nitei Gavriel thought that was nonsensical unless the men had not heard Parshas Zachor. Those are minor things. Women who want to participate in the first Megilla reading … and have arranged a non frum jewish baby sitter (eg Russian, Israeli), must ensure that the baby sitter not perform any Chillul Shabbos in order to arrive on time. If someone can please explain to me why a Russian Jew or Jewess or an Israeli Jew or Jewess should be explicitly listed as examples of “non-frum”, I’d be interested. Indeed, why do I need examples? This is what is wrong with some segments of Jewry. They are too quick to call people non-frum, too quick to make conclusions about who is likely to be non-frum and then do or say little positive in this regard, let alone Kiruv. Why assume they don’t know what to do especially if they work for you and live within walking distance etc Why even mention Russian or Israeli. That is a massive put down and totally unnecessary. Sure, if it’s not a regular babysitter, then one needs to make sure they don’t cause them to sin, but if it’s a regular babysitter, you’ve probably already told them so much (“don’t warm up anything for the children?”, Meat and Milk and the list goes on. Here is a better approach: pay the babysitter extra money and encourage them to hear a later reading of the Megila (when you come home) and invite them to your Seudas Purim (especially if you are so certain they are non-frum and clueless). Maybe tell them what Purim is all about? Drop off Shalach Monos? Perhaps Matonos LoEvyonim? Really! We can be a bit more sophisticated and positive about doing good in this world than focussing on minutiae when bigger issues stare us in the face? What if the babysitter is indeed a Russian emigre with a husband (you have never seen), and both have never seen a Purim Seuda? Sorry, Heichal HaTorah, there seems to be a lack of sensitivity, something that prevents Geula, rather than encourages it. Frankly, in the next edition, there should be an open apology. I think that’s at least as important as whatever else is written in the next edition. Postscript: When I pressed post, WordPress the blog infrastructure suggested that “non-frum” be replaced with “no-trump”. I nearly fell off my chair. A Freilichen Purim to all, frum and not yet frum. It is sad that you cannot see the good work Heichal and its Rabbi are doing. You are criticizing the Rabbi using Russian and Israeli jews as babysitters. But you unfortunately cannot see what is written. All what the Rabbi did was given an example of 2 types of Jews who are the most common that do babysitting. Nothing more or nothing less. Maybe the Purim wine affected your understanding that this was in no way suggesting that Russians or Israeli are any more or less frum. If you come to Heichal you will meet some very nice Russian and Israeli members. Daniel, it is a little sad that you have concluded that I “cannot see the good work Heichal and its Rabbi are doing”. Why do you say that? I have said nothing of the sort. Indeed, I read the publication and impressed with the Shiurim and hub of activity. You would however surely not therefore invalidate me from making a comment. You should know this wasn’t noticed by “Isaac Balbin” alone. This was noticed by the majority of people around me, including Adass types, who found it totally inappropriate. The Halacha doesn’t require us to besmirch somebody’s permanent baby sitter in public by referring to their ethnicity. More to the point, tell me please, an Australian who has been through many of our Jewish Day Schools would know much better? What is the point of IDENTIFYING any group when all that does is create an us vs them angst which is only too prevalent in Charedi circles. 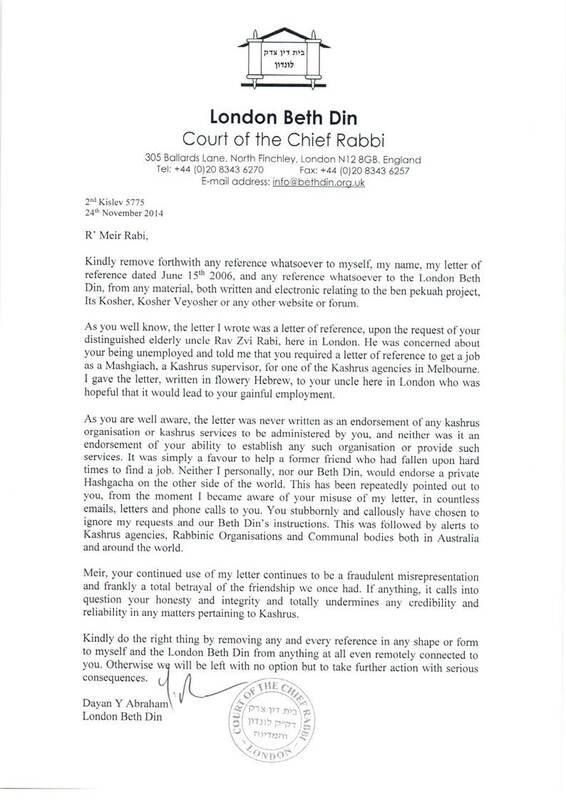 Halachically, I would suggest the Rabbi merely note (as he has in other articles about Shabbos preparation, Bishul Akum etc) that WE, yes WE should diplomatically remind our home regarding the parameters. I took it a step further, if the Rabbi has some worries about Russians and Israelis in particular, then let them conduct some special sessions for Halachot of Baby Sitting, Home Help for Religious Jews. Done nicely it would be a kiddush hashem. Don’t you agree? Inviting them to Seudas Purim is even better. Now Daniel, I don’t think we know each other, but I’d like to note that we have MUCH bigger problems with AUSTRALIANS who have been through Jewish Schools of sorts and are clueless. What do we do about them? Do we learn another Daf of Gemora or do we have a one hour shiur in our house or Shule for them. Keep up the good work, but PLEASE be more sensitive.